You might have seen image posted on SlashGeo. It prompted the Twitter conversation below. 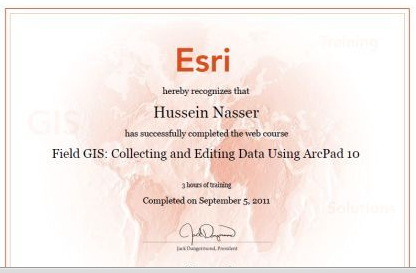 I don't believe the writer who posted the certificate misrepresented how one can complete a (free) Esri course and receive such a certificate. 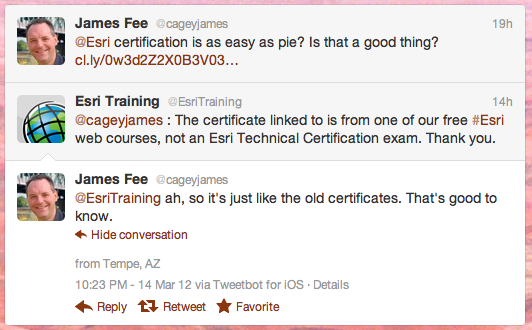 And, I'm not sure if Mr. Fee was really confused about the difference between a certificate of completion and Esri's formal, test-based Associate and Professional Certifications. 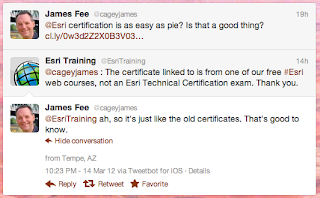 But the interchange does highlight how a potential employer, especially one not conversant in the GIS/Esri/Education lingo regarding GIS recognition, might be. Employers would need to know about certificates of completion (like the one above, saying a course was completed), industry certifications (GISP, ASPRS), educational institutions' certificate programs (Penn State Post Baccalaureate Certificate), and vendor certifications (Esri's Certification program). And, now of course, we have a whole new set of credentials that may make their way to GIS: badges (for example from Mozilla or Khan Academy) and letters from instructors for those who participate in massive online classes (for example, the Stanford AI class). All of these (mostly free) learning and credential collecting opportunities tend to have as part of their mission making "education available to all." Khan Academy basically adds the term "world class" to that to define its mission statement. I can find no fault with efforts to bring education to all. There are many issues to be resolved with badges and other credentials; I want to set that aside for right now and focus on these free learning opportunities. Who are they for? Ideally, they are for anyone who wants to learn something "new." Audrey Watters (my favorite edtech writer/podcaster) is currently taking a massive online Python course. Among her fellow students? Those who program in Python for a living! Moreover, she reports that in the course forums there wasn't quite the respect for "newbie" questions as she might hope. Why are working professionals taking the course? I can only guess, but fear one reason might be to gain the credential at the end. It's a way, as the SlashGeo poster put it, to "help you pimp your resume." Pity the overworked hiring manager who gets a pile of resumes and has to navigate all these certificates, certifications and badges! What is he or she to do? Ask a lot of questions. If the applicant hasn't provided a reference to explain the nature of credential (say a link to the GISCI website), the employer should ask about it either in a phone or personal interview. Ask the applicant who granted the credential, what is means, what was required to attain it and why they pursued it. That last one is key and can reveal a lot about the applicant. I'd love to hear an applicant who took one of Esri's free three hour classes explain they did so because they were taking a university course that included the topic and didn't quite understand the key points. I'd love to hear that an applicant was working on a project (for work, school, or on their own) and needed to know how to do that specific thing to complete it. Other answers, such as "I don't know," "I don't remember," or "to pad my resume" would not be as promising. 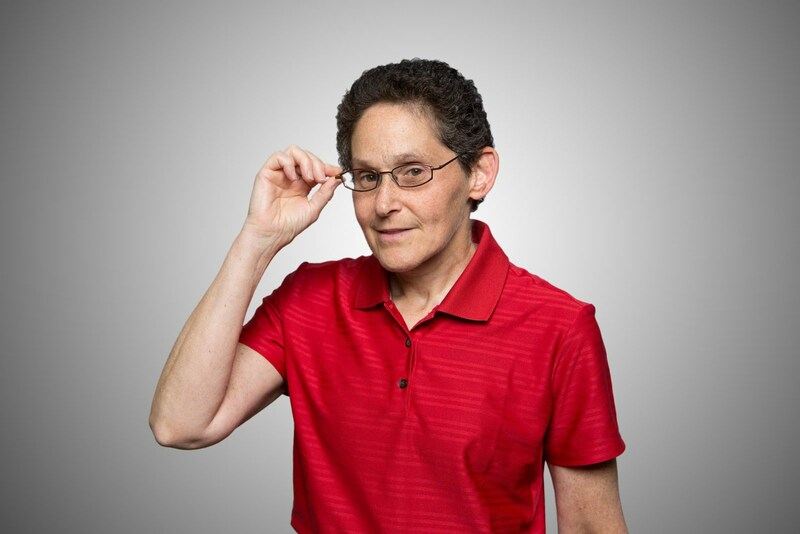 As more and new types of credentials appear on resumes, hiring managers, the consumers of those documents, have to dig deeper to tease out their value. Alternatively, they could ignore the credentials and administer a test or assignment to see if the applicant has the skills. Great post! In my personal experience, these certificates indicate someone who is simply "pimping" their resume often because their work experience isn't truly substantive. It obviously depends on the position that needs to be filled but, in general, I'd rather see someone with solid education credentials (bachelors or better, in just about any subject) and meaningful work experience that forms a good building block for a fit with the new organization and role. A GISP credential and 3 years of wrangling shape files in ArcGIS doesn't really get me too excited. I'd rather hire a history major who is self-taught in Python and analyzed birth certificates from the 19th century to reconstruct a cultural narrative. Or someone else with a background in geography, econ, computer science, physics, math, whatever - but, they've demonstrated the ability to think creatively and synthesize various data elements to construct a reasonable solution to a challenging problem. I would love to see a serious study on whether anyone pays any attention to most of these "credentials". I bet those in the credentialing business won't like the report.